Some good stuff this week, but the one that made my phone blow up was the one I reviewed at Fantasia. Aidan Turner has some fans who will retweet the heck out of people who tweet that review you wrote. I started the week off with Intimate Strangers, which had me mildly curious and wasn't scheduled to play any more evening shows after that, because the Korean dark comedy is the thing that goes when a theater needs extra screens for previews and special presentations and the like. It's pretty good, although I am absolutely considering the "remake review" when the Mexican version comes out in January. The next day was my first Bollywood movie a while, Thugs of Hindostan, which is not great, but it's got the basic swashbuckling stuff down. Barely got there in time, though, because the show started at 6:30pm rather than the 6:45pm I expected. Good news when settling in for a three-hour movie. I am starting to wonder why the Fresh Pond plaza guys don't put a real set of steps on the landscaping that even Google maps tells you to cut across, though - someone will eventually get hurt. 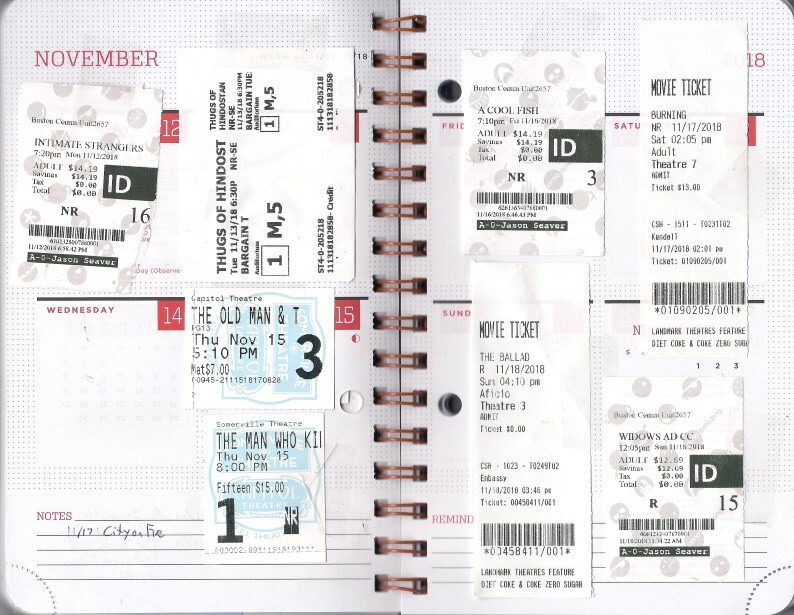 Worked a bit late on Wednesday so I could cut out early on Thursday and catch the last screening of The Old Man and the Gun at the Capitol, with just one late show left at the Kendall that night. Really waited until the last minute on that one, which is a shame. It did make for a pretty perfect double feature with The Man Who Killed Hitler and Then the Bigfoot, which I was presented by Imagine Magazine, and they had some seats roped off, enough to send me to the balcony. Still a better view than I had in Montreal, though. The most convenient thing on Friday evening was A Cool Fish, which has a few really nifty pieces that could fit together much better. Saturday's movie would be Burning, which is terrific, although I was taken a bit aback that MoviePass didn't work at Kendall Square that day. If it's no longer working at Landmark, I'm not sure I see the point of it anymore. It being a long movie, it didn't sync up with much else, so I made another dent in my last shipment of discs from Hong Kong with City on Fire. Grindhouse as heck. I probably should have done laundry on Sunday morning, but instead headed out for Widows and then, for the second Sunday in a row, to Waltham for a Netflix movie, because that's good enough to say you're playing the Boston market. Sad, really, just a half-dozen or so of us in the theater, laughing like crazy at The Ballad of Buster Scruggs. It's too good for Netflix to make it hard to see with an audience, honestly. What'll be on my Letterboxd page this week? Who knows, considering there's family to visit for Thanksgiving and Park Chan-wook directing a three-night miniseries. Robert Redford has backtracked a bit on this being his last film, and it's natural to be of two minds on that: No film is going to put a better cap on his career even as it says to live your life doing what you know and love. Redford is a delight, of course, the head of a cast of folks from Casey Affleck to Sissy Spacek all slotted into parts where they can do what they do best. There's a sort of joy to Redford's lifelong bank robber Forrest Tucker, who's got one toe over the line where devil-may-care maybe becomes a little dangerous that blends well with Spacek's basic good cheer and offsets Affleck's hangdog uncertainty just enough to bring them all into sharp focus. They get to stretch a bit as the film nears its end, just enough to stay true to their characters' selves while still showing what this pursuit has given them. Filmmaker David Lowery tells the story in simple, relaxed fashion; it's never rushed but a lot happens in 93 minutes, while also leaving plenty of room for when little is happening and you can just watch these people. It's beautiful to look at, expertly recalling the films of Redford's prime without feeling like a pastiche and getting maximum mileage out of the cast's often craggy faces. Lowery also captures a lot of important details that ring true, like the way folks look askance at the white detective's black wife and kids (and how that family obviously adores each other), or how, even as people are charmed by this elderly stickup artist and put the best face on it afterward, they're clearly scared in the moment. Those moments tip the film just far enough from nostalgia when it counts that Lowery can indulge a bit later. Above all else, this is a movie that puts a smile on one's face. It's small, it maybe won't receive awards because it doesn't necessarily challenge its cast, it maybe false-ends once or twice too often. But it's a delight, and if it's the last we see of Robert Redford, he left the stage reminding us why we like Robert Redford. On a second viewing, I find myself a little more impressed by the sheer audacious oddness of this movie's makers in taking a pulpy premise and spending a lot of time pulling back and not necessarily using the crazy bits to stint on how people react to them. The film maybe doesn't have quite so much of the high adventure as I remember - the first time through, I got caught up in them, with the second time finding me examining details a bit more - but it holds up. Mostly, though, I love Sam Elliott playing this thing straight as an arrow, even when in the moment when the movie gets a big laugh from him not believing that the government wants him to kill Bigfoot and the Canadian envoy isn't quite processing his WWII adventures. It's a wink that feels genuine even without the audience watching. It's been a while since I last watched City on Fire, if indeed it's one of the movies I watched when Hong Kong cinema was in vogue and repertory series were appearing on a regular basis, and it's easy to forget sometimes just what a shoestring these movies were made on back in the eighties, cranked out quickly and not really expected to last. It is one of many undercover cop films that came out around that time, and looks a bit rough when you consider what John Woo, Andrew Lau, and Johnnie To would do later, after having had what Ringo Lam does here as a model. Even if he's building a prototype, though, Lam's still building something remarkably efficient and comfortable, showing what a difficult job the police have in getting cooperation from the public to make a dent in crime and making it feel like an ongoing issue without the detectives explaining it to some rookie and otherwise trusting the audience to know this song's rhythm and recognize when it's done well. Chow Yun-fat is maybe not best served when his character being kind of a lousy boyfriend/fiance is used for comic relief, but he's quietly terrific as he makes his guilt over that part of the character, highlighting how much his loyalty can serve as an anchor in the job he is unfortunately good at. Of course, what arguably really sets this apart is that Ringo Lam is really good at violence: As much as the opening murder of an undercover detective is effectively nasty, it's a heist that goes from professional to excessive that really opens one's eyes. It's big and bloody and stops being entertaining just long enough to highlight its cruelty. Lam never really lets his audience purely enjoy the action as a welcome release - it's thrilling but has ugly consequences, right down to the orgiastic hail of bullets that finishes things off reminding the audience that excessive force in the hands of people who aren't professional has consequences just as destructive as the criminals. The bit after that is insanely 1980s and goofy, from the saxophone solo with the unambiguous lyrics to the contrast between goofy cheer and grim death, but it works, and makes it clear that Lam does, in fact, have a bit of a point to make behind the cops-and-robbers stuff. I'm not sure how much of what makes Widows great (and, admittedly, is the source of the odd weakness) comes from it having been adapted from a TV show, but that DNA seems important. The movie is full of interesting tangents while never feeling like it's got a wasted moment, as if writer/director Steve McQueen wouldn't allow himself to actually dispense with any subplot in the name of simplifying the story but instead boiled them down to just what the movie needed to not have anything left out. So maybe you could have a little more of Viola Davis actually acting as a mastermind, but the audience instead gets to get a sense of her from how she treats people and how she professes unawareness of her late husband's business; it's the kind of great performance that doesn't have an obvious clip to pull out for an awards show. She's matched and complemented by Elizabeth Debicki, who never quite loses her willowy uncertainty but gains an impressive confidence anyway. And maybe you can excise Robert Duvall and Colin Farrell as the last couple generations of a political dynasty, but why would you do without Duvall in any situation, even if Farrell's smarmy, Mitt Romney-looking son was not most likely the best thing he's ever done with an American accent. Or Daniel Kaluuya as a stone-cold monster that makes Brian Tyree Henry look almost likable as his corrupt, opportunistic brother? Everyone involved is good enough and has enough going on that it's impressive just how much this movie sings even with relatively little actual heist action, although the finale is, in fact, pretty terrific. McQueen has given the audience just enough prep to follow along but also keeps it from being particularly mechanical, both because he wants it to be about the ladies running the job and because by that point we don't really love the idea of success meaning that they successfully followed a plan that a man drew up. The movie pivots, smartly and fairly, from its ensemble to give Davis the climax, and it earns the heck out of the applause that the audience gives it. It ticks me off that I'm not going to be able to add this to my Coen Brothers collection, and that it may not be easy to book for repertory theaters in the future, but Netflix did pay for this, and that does count for something. The movie starts with one of the funniest things I've seen in a while - Tim Blake Nelson as a singing cowboy gunslinger who hates his violent reputation but doesn't exactly shrink away from finding situations where he can draw down on someone, and it is fantastic black comedy with a moment which rivals the not-an-inhaler bit from Intolerable Cruelty in terms of violent, hilariously terrible slapstick. The next segment is a similar sort of black comedy, but soon the film moves to darker, subtler sorts of humor. Even in the most serious, dark segments of this anthology picture, there's a sense of absurdity that this beautiful country is filled with such violence. The Coens take to the omnibus format well, telling nifty little stories which have some depth but also great punchlines. Half of the six are excellent, but the other half are very good indeed, and that's a heck of a track record.